It probably won’t surprise any of you to hear that I love to decorate with quilts and so do many of my friends and family members. For the next few months, I’m going to showcase some of these beauties and the way they dress up an ordinary room. Note: All of the quilts below are hanging in real houses, just the way you see them. Nothing has been changed for the photo shoot (if you can call taking pics with my camera a “shoot”). 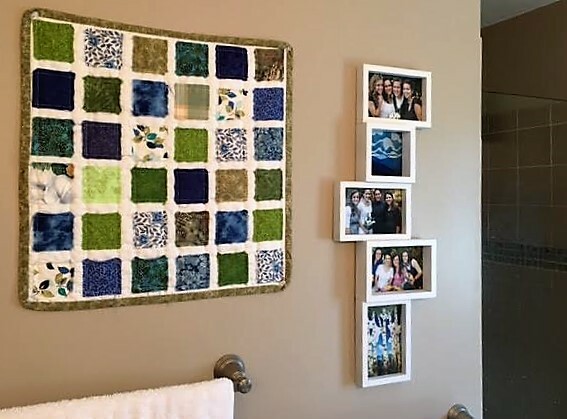 One of the best places to use a quilt is on a large, blank wall. Blank walls practically beg you to let them share their space with a beautiful quilt. The quilt below is absolutely stunning! 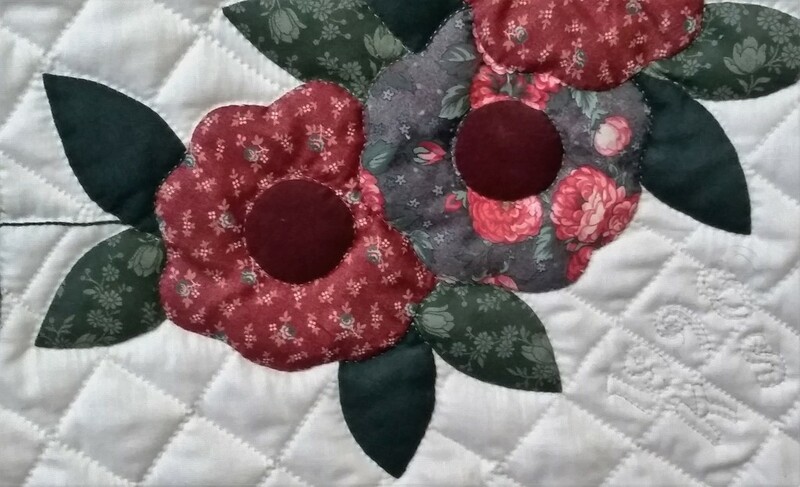 It was sewn, hand-appliqued, and hand-quilted by Pennsylvania Amish quilters in 1998. This is a close-up of the bottom right-hand corner of the quilt. The stem coming off the left-side is hand-embroidered. 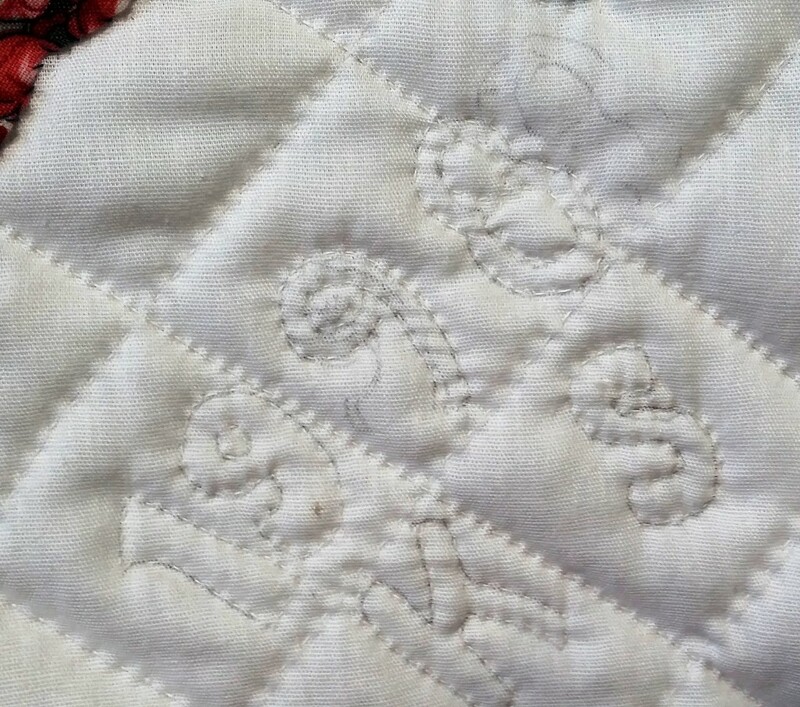 Notice that the date and the quilter’s initials have been quilted into the very bottom. My finger helps you visualize the size of the letters and numbers. The stitches are teeny! And washing the quilt would remove all the pencil marks. Our next quilt hangs in the entryway of its home. 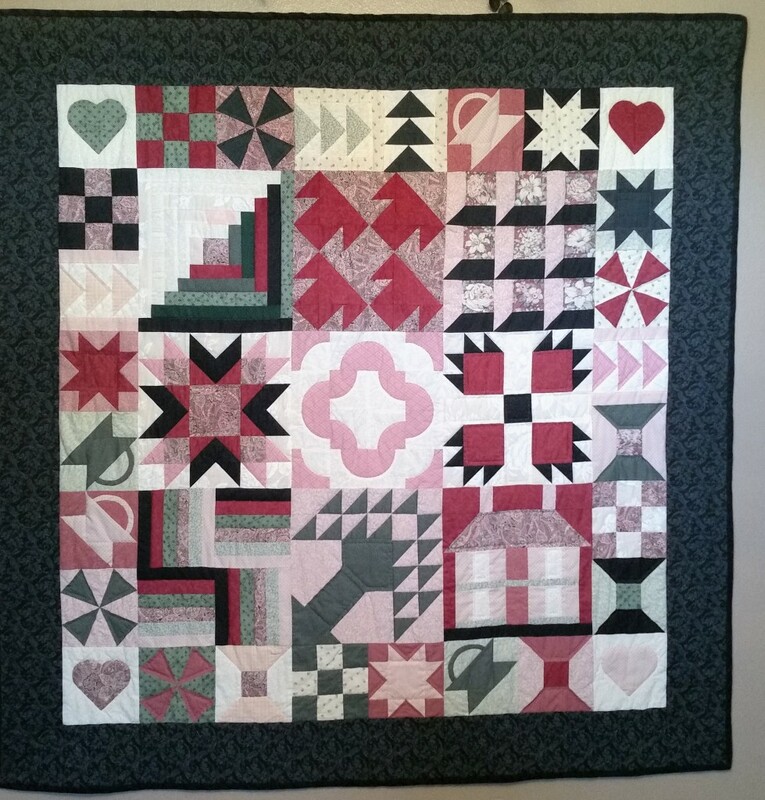 The quilt was sewn and hand-quilted between 1991 and 1993. 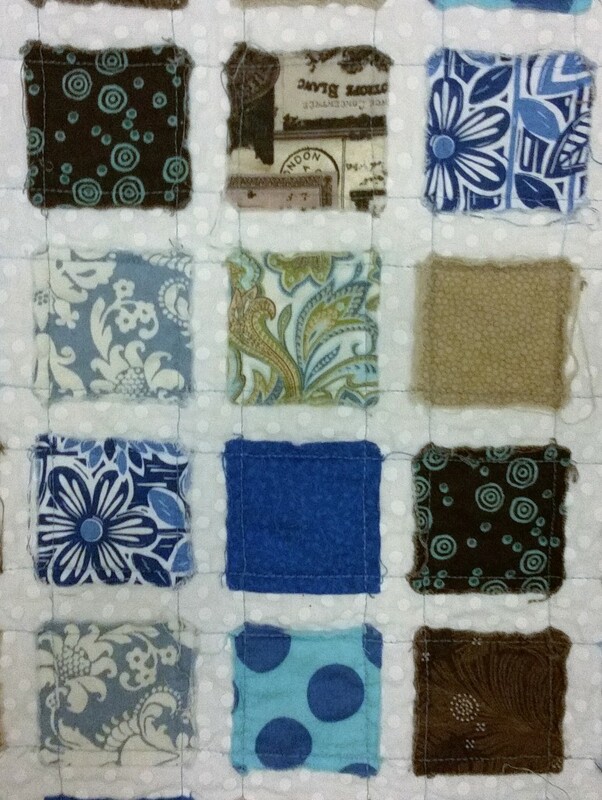 It is a fairly typical sampler quilt because it includes “samples” of many different kinds of blocks. 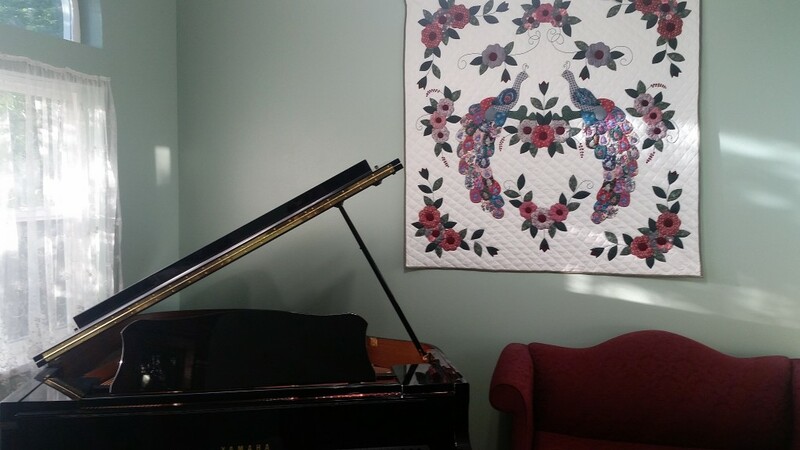 This quilt is hung opposite of the front door, so it’s one of the first things visitors see when they enter the home. 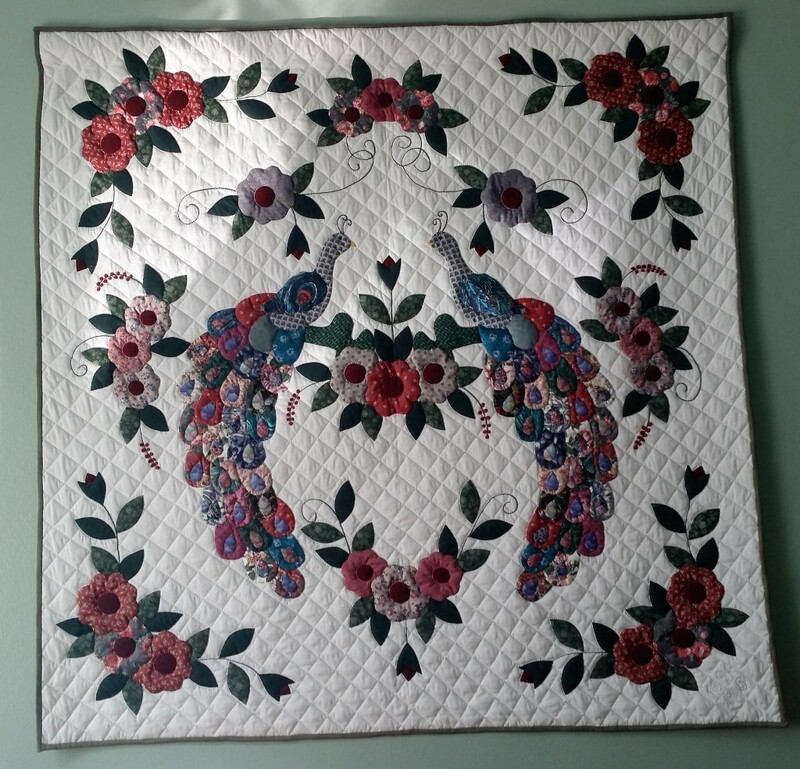 Unlike the peacock quilt, this one is made with only two main colors: pink and green. Is that a good or bad design choice? (I like it! It makes the quilt more striking, a good quality, I think, for the entry way.) The home owner asked me to point out that the dried flowers above the quilt are very old. Any ideas for what she should replace them with? 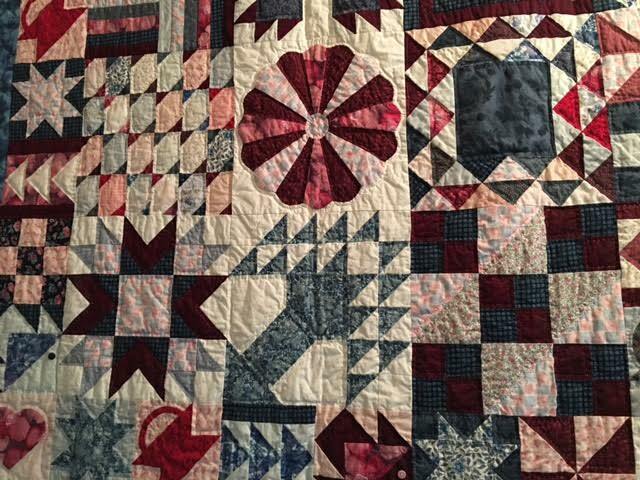 Here is another sample quilt, rose and blue, and it was particularly difficult to photograph because it’s hanging in a stairway. The photo on the left is looking down the stairs, and on the right, looking up the stairs. 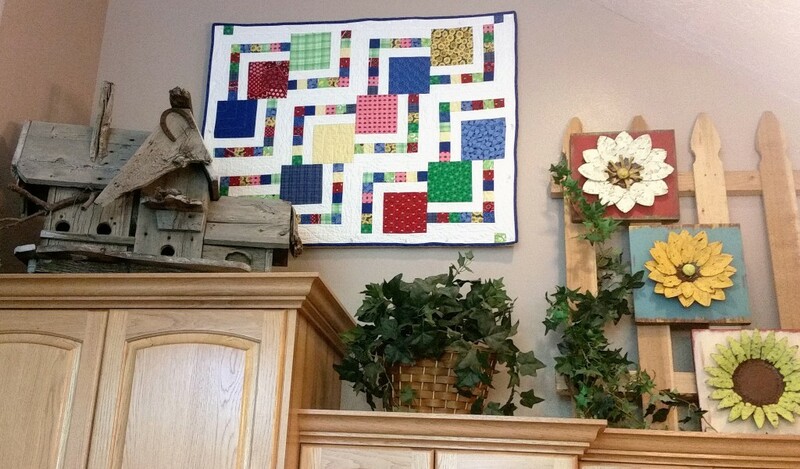 This is such a clever place to display a quilt! Here’s a closer look at some of the blocks. 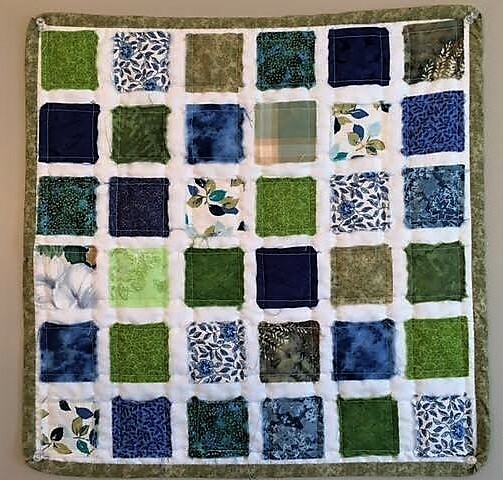 Why does this sample quilt look so much busier than the pink and green one? The next quilt, a ragged-block quilt, seems very restful to me. 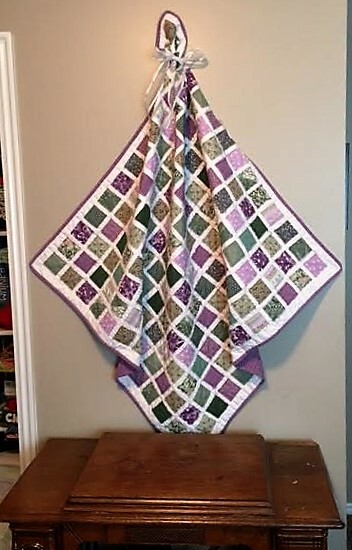 The colors, their random placement on the quilt, and the somewhat-shaggy edges of the blocks feel more peaceful than, say, the sharp lines in the green and pink entry-way quilt. The blocks on this quilt are sewn on top of a piece of white fabric, and the edges of the blocks aren’t finished. In fact, after you make this quilt, you wash it to encourage these raw edges to fray. This is why the blocks look “shaggy” and not precisely square. 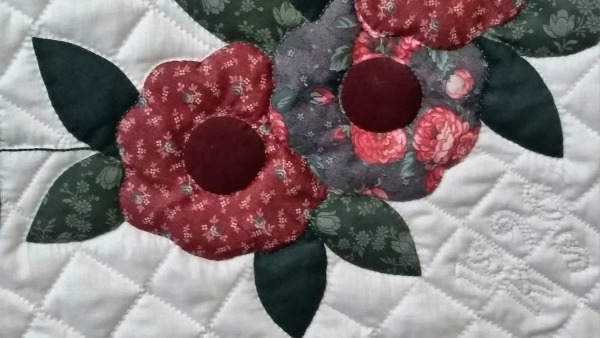 The batting is 100% cotton, so it shrinks slightly in the wash, which gives the quilt the same kind of wrinkly, puffy look that most old quilts have. And guess where this quilt hangs? In the master bathroom, over a large, happy plant sitting on the edge of a jetted tub. 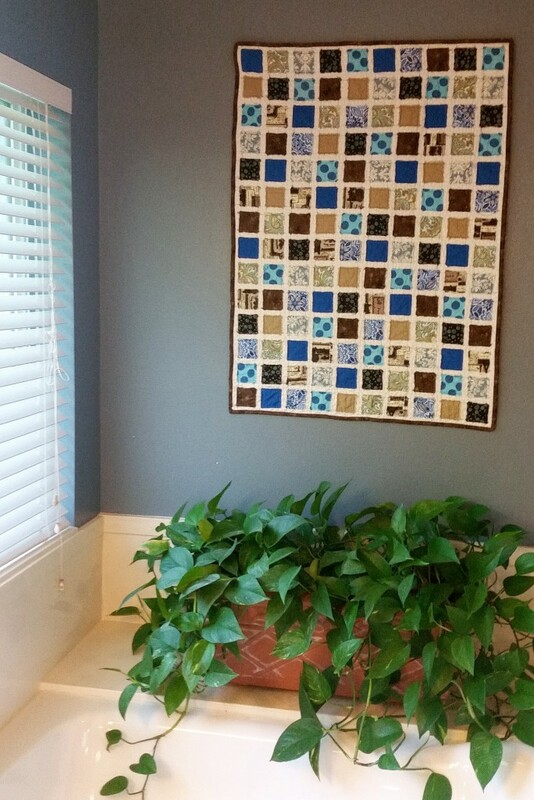 Yes, the quilter’s husband was a little surprised that she wanted her quilt in a bathroom, but he good-naturedly hung it. (What a great husband!) 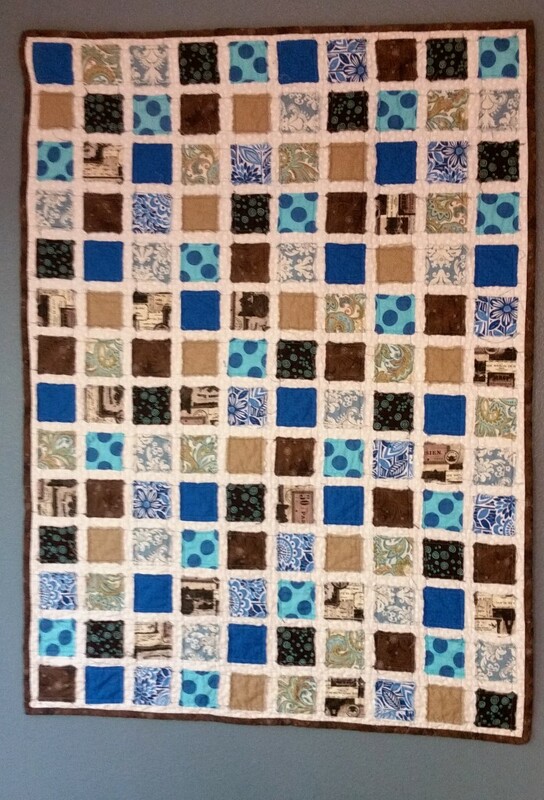 This quilt is also made of basically two colors, brown and blue, but the many variations in the fabrics make it seem much more colorful than the pink and green quilt above. Notice how well the blue color of the wall sets off the quilt. I love the way the next quilt has been displayed! It has not been hung flat and square against the wall. Instead, the home owner has tied a bow around one of the corners and hung that corner on the wall. 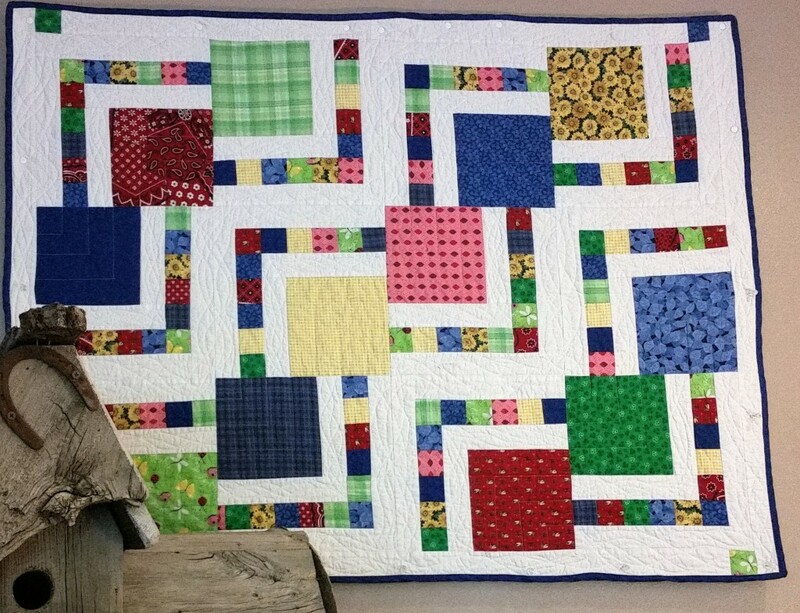 But she didn’t let the quilt hang straight down—she wanted to see the beautiful blocks! 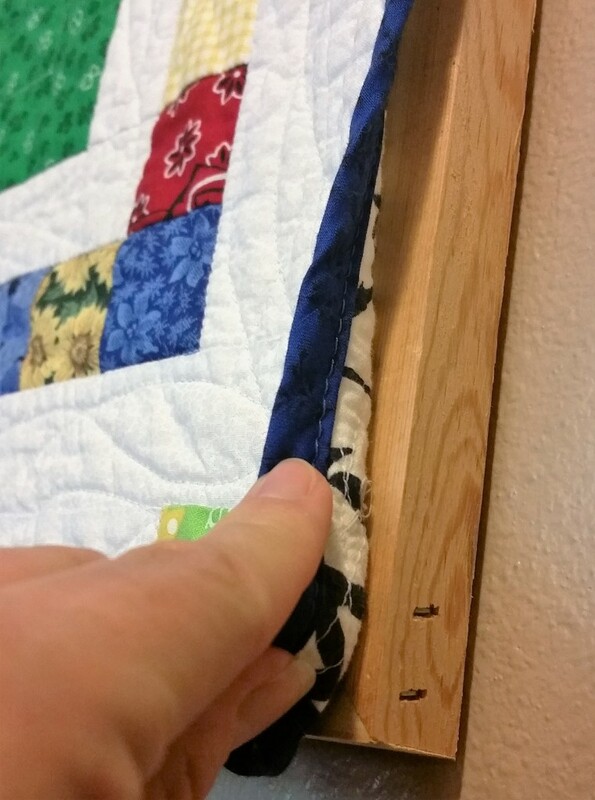 She used push pins to hold the quilt open against the wall. The quilt, by the way, is hung above an old treadle sewing machine. 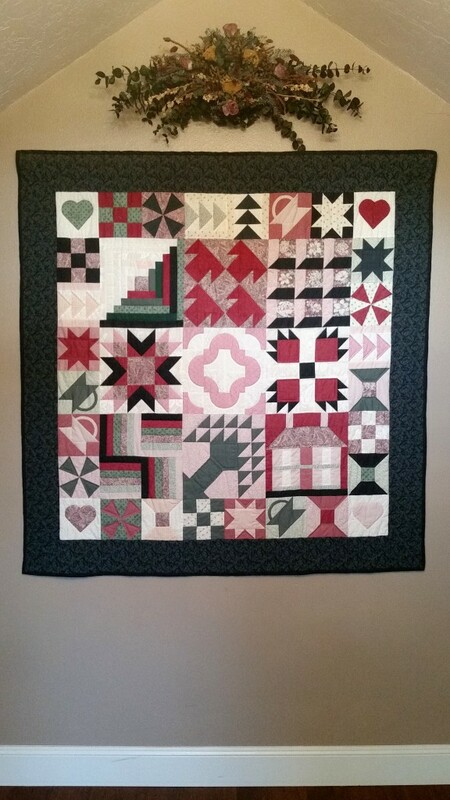 Here is another example of the ragged-block quilt, though smaller than the two above. The taupe colored wall nicely sets off the rich greens and blues of the squares. 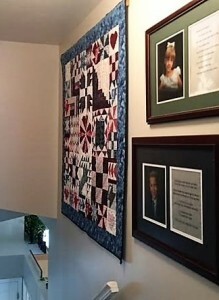 This quilt is also hung in a bathroom, above the towel rod, with some framed photos next to the walk-in shower. I love the colors of our last quilt. They are so happy! This quilt is a great example of a scrap quilt: it is made from whatever pieces of leftover fabric the quilter happened to have. Though it may look complicated, this quilt comes together fairly quickly, and it was finished just last year. 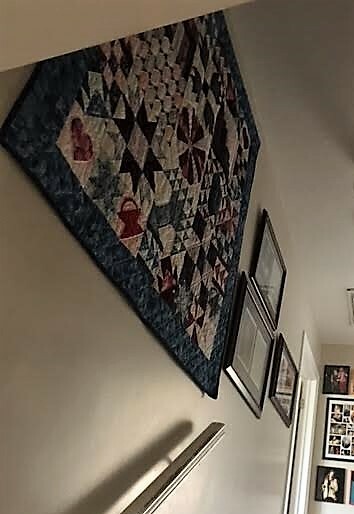 This quilt hangs above the kitchen cabinets in a kitchen with very high ceilings, 13 feet in some places, so the quilt helps fill up an otherwise rather tall and blank wall. Notice the decorations around the quilt. The bird house is made from 80-year-old barn wood and an old horse shoe. The picket fencing came from Lowe’s, the metal flowers from a yard sale, and the greenery from a local craft store. How did I manage to hang a quilt so far off the ground, over a set of shelves? First, I married a cooperative, long-suffering, handy husband, who is also handsome. Ha, ha. (I know there are plenty of women who can build things like this, but, alas, I am not one of them.) My husband built a frame out of 1x2s (wood at Home Depot) that is the exact size of the quilt. Then we attached the quilt to the frame using clear push pins (which you can’t see from the ground). We were careful to make sure the quilt was taut and square on the frame. 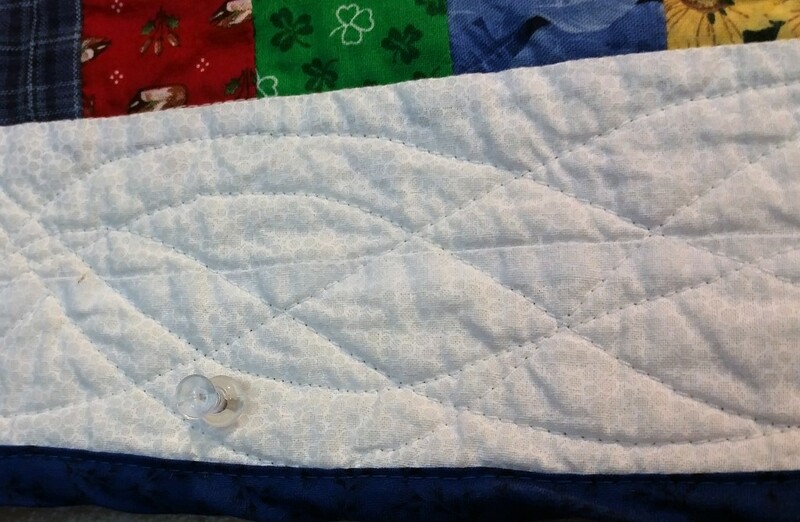 The photo below shows the push pin, and, as a bonus, the wonderful curvy quilting. Here’s another photo of the final result. 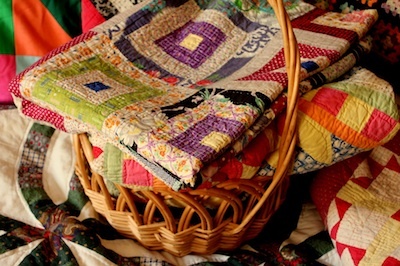 Beautiful quilts and a lovely way to decorate a home. I need to come and stay with you for about a week, so that you can teach me how to quilt. And finish the one I started a year ago. Beautiful, I love particularly the peacock quilt and the one over the treadle sewing machine. All are very pretty!